A little different than usual. We put lots of provolone cheese mixed with sharp cheddar to make this one. A little garlic powder sprinkled on each slice of the cheese for a spicy flavor. Another one of our favorite game day appetizers. Adding a some sour cream, jalapeno peppers, black olives shredded lettuce and chopped tomatoes. We also like to add some grilled chicken that has been spiced up with garlic and marinaded in Italian dressing first. To us this is just a grilled cheese tortilla appetizer with a spicy Italian garlic flavor and we just love these overstuffed with provolone instead of any other cheese. Topping it all off with all the trimming including a dollap of sour cream. The easiest part is cooking them. Just take a large greased heated non stick fry pan. Add a few tablespoons of olive oil on the bottom of the pan first . Add a flour tortilla, cheese on top of that, at least four slices of cheese, two of the provolone, two of the sharp cheddar, ( add chicken at this point if you decided on a meat Quesadilla) sprinkle cheese with garlic powder, pepper, parsley, top with another flour tortilla and brown on both side until the cheese is melted and bubbly and outside is crispy. Actually allot of times we eat these plain, nothing on them except cheese, its a great snack and I can't tell you how addicting they are with that garlicky flavoring inside.....it makes all the difference. So I hope you like our version of this classic Quesadilla. Italian Style , you wouldn't have expected anything else. Just take a large greased heated non stick fry pan. Add a few tablespoons of olive oil on the bottom of the pan first . Add a flour tortilla, cheese on top of that, at least four slices of cheese, two of the provolone, two of the sharp cheddar, ( add chicken at this point if you decided on a meat Quesadilla) sprinkle cheese with garlic powder, pepper, parsley, top with another flour tortilla and brown on both side until the cheese is melted and bubbly and outside is crispy. I wrote you yesterday about an Italian dessert we can't figure out. Could you check this out and let us know please?! mmmh. quesadillas are family fav...Looks fantastic! Sounds yummy - provolone! great idea. 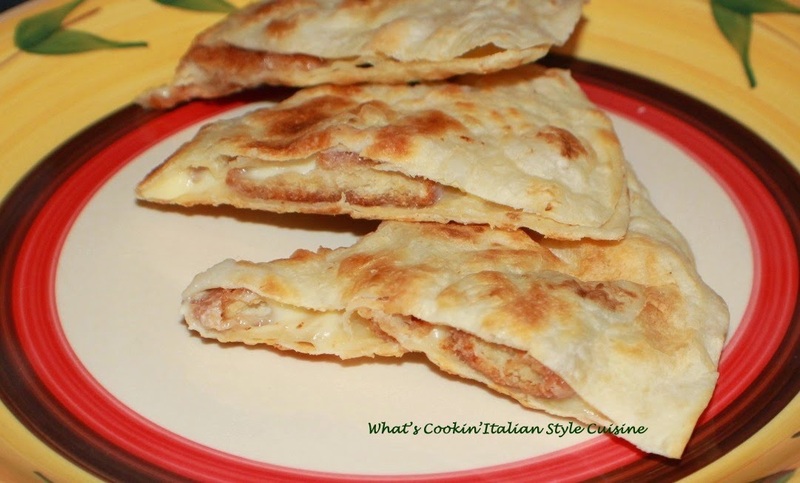 A quesadilla with an Italian twist sounds like an awesome idea! love it! These are so delicious! I bet my kids would love to have this for lunch tomorrow. Thanks!